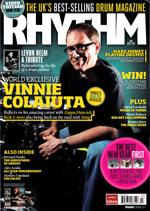 One of the world's most revered session drummers, Vinnie Colaiuta reflects on his amazing career and tells Rhythm about being back on the drum throne for Sting. Currently back in the UK with Sting, on his Back To Bass tour, tonight the band will play the second of their three sold-out shows at Hammersmith Appolo. "It's actually quite poignant that we are performing there, because it's where I played with Frank Zappa on my first trip to London all those years ago..."
With a remarkably versatile session career that, in addition to Sting and Zappa, also boasts Joni Mitchell, Herbie Hancock, Chick Corea, Jeff Beck, and Faith Hill to name but a few, Mr. Colaiuta has become one of the most in-demand and revered players of his generation - his awesome technique, sublime groove and impeccable musicianship inspiring and influencing a plethora of drummers in the process. "I have so much to be thankful for, and I'm blessed, deeply honoured and so grateful to have had the privelege of working with so many people that I love and respect." After leaving school Vinnie continued his studies at the renowned Berklee College of Music in Boston, and would have enrolled for a second year had he been able to afford to. Instead, with just $80 in his pocket, he jumped on a bus with his drums and travelled across the United States to LA in search of that first big gig. "I thought at least if I was starving I wouldn't freeze if I had to sleep outside," he chuckles. But, as fate would have it, not long after arriving in the City of Angels, Vinnie heard that a certain Frank Zappa was looking for a new rhythm section. He begged himself an audition and the rest is history. Good, really good... The old guard - Sting on bass, Dominic Miller on guitar and me on drums - has been joined by Dominic's son, Rufus, on rhythm guitar, Peter Tickell on violin, and Jo Lawry on vocals and violin. This particular touring segment has a freshness too, because we are playing things that we haven't done before and Sting has also been focusing a lot on narrative. We have great songs, great content and great stories, and I think it's so important to be able to engage with the audience on all those different levels. Let's face it, Sting is a master lyricist and his command of the language, and his knowledge about how to encapsulate that in a song, is of an extremely high level. This is the songwriting art form, coupled with musicianship and all the skill sets that structure demands, and there are very few situations in this day and age that require those capabilities on so many different levels. As a musician, when you are privileged enough to enjoy that kind of an exprience, it's like soul food - it's good for you - and you want to give your best back. You were actually out on the road with Frank Zappa when you first met Sting, weren't you? It was around the time that Zenyatta Mondatta came out, and our sound guy woke me up to tell me that we were off to see The Police. We went backstage and Stewart [Copeland] was there taping up his hands and Sting was running in and out... When they played, I just couldn't believe the sound I was hearing coming off that stage from three people. They were ground breaking, iconic and innovative, and the quality of those songs and Sting's voice was incredible. It was, but luckily, when I came off the road I just went straight back into it. It's not like that anymore though, even for me, and I say that with humility. I've been doing this for 33 years now and I've survived drum machines and new people coming in and out of town, but the issue we are facing now is a global one, and it's a real one because people just aren't buying records any more. I'm not saying there isn't great music to be had out there, but the problem is that the floodgates have opened and everyone is talking over each other so loudly that you don't actually hear anyone. Everything is being given away and we've lost the gatekeepers, the arbiters of quality - who regulate the amount of water coming through that valve. The downside of it all is that real talent can be lost in the noise. The first shows that you did with Sting were in support of his third solo record, The Soul Cages, and it's almost like things have gone full circle now because, when the Back To Bass tour returns to Europe later this year, David Sancious will be joining you on keyboards, completing that original line-up. That's right - it'll be the original four-piece, plus Jo and Pete, for the summer leg. The four of us have obviously known each other a long time and we share a lot of history, so there is that degree of familiarity and camaraderie that old friendships bring. In some ways this gig is like stepping back into a comfy pair of shoes, but in other ways, we've all changed and it's interesting how each incarnation finds its own voice. You were already tinkering on your mum's pots and pans when you saw The Beatles on The Ed Sullivan Show all those years ago, but it was that performance from Ringo that really added fuel to the fire, wasn't it? That's right - it was the first time that I'd really seen drums on TV and, after watching Ringo, I was desperate to get my own kit. As a kid I was really interested in science as well, but music was always there, and like most young drummers, I'd bash away on pots and pans. When I first tried to play, for some reason I just could, and I never had a problem with one foot doing one thing and the other another. I was so fortunate too, because my parents fostered all of my interests and it was actually my mum who cleverly encouraged me to take drum lessons after listening to me play along to a Motown Temptations' track one day. It's funny, because years later I actually ended up recording with them. I went to see the band director at my school who gave me a drum book and pad, and then showed me how to hold the sticks - with traditional grip. Well, that was it... I walked out of the room 30 minutes later feeling like I'd been hit over the head with a hammer. It was a major 'light bulb' moment for me, and it's when I knew that I wanted to be a professional drummer. Most kids would have thought that being given a pad and book was crap, but not me - I went nuts and couldn't eat it up fast enough. Your dedication to self-improvement is legendary, and even at such a young age, your desire to learn was insatiable, wasn't it? I was doing the whole bit - jazz, orhestral, orchestral rock, marching bands, drum camps, everything... I was a good geek for learning information and that information was valuable, because it was the beginning of a whole process of development that took years. As a teenager, I could assimilate information quickly, but what I didn't realise until later, is that you have to let that information gestate... When you're young you think you're a hot-shot, ready for everything because you've played along to records and learnt all those little tricks. But here's the thing - you don't know how and why those drummers played what they did until you have the benefit of experience. I've sweated blood - literally - and put a lot of work into what I do, and these days so many people are not prepared to put that time and effort in. Everybody wants to be Superman overnight, and that's encouraged by a media where everything is instantly available - be that visually or audibly. And please don't just break everything down to chops and groove either, because that means you are only looking at two dimensions when there are so many more... Basically, the whole thing is process, but life is process. Forgive me for sounding clichéd, but the joy is in that process and the fact that there is always something new to aspire to. Bingo! Embrace what you do, be yourself and - most importantly - be happy being yourself, because that's all you've got. Role models are important, but you have to move on from the imitation phase and be comfortable with your own identity. You'll hear someone like Steve Gadd play half of a bar and you just know it's him... And look at be-bop - essentially variations of the same beat with some independance and other flourishes thrown in, right? Well, if that's the case, how come Art Blakey, Max Roach, Charlie Persip, Shadow Wilson, Tony Williams and Elvin Jones didn't all sound the same? It's because they all had their own personality and voice on their instrument. And that voice doesn't have to be flash to be effective does it? The last time I saw Elvin Jones play he played simpler than I had ever seen him play before, and he knocked my brain into a whirlwind. I literally nearly fell off my chair just watching him play the ride - he played time differently on that cymbal to how I had ever heard him play it before. The skies opened up for me, just because of what he was saying with that right hand, but it was still instantly recognisable as him. Well, I met another drummer at a music camp when I was about 12 and he asked me who my favourite player was. I said Buddy Rich - I was heavily into Buddy at the time - but, when I asked him the same question, he said Tony Williams. I'd never heard of him and I often wonder where that kid is now because, man, namechecking Tony at that age - he knew what was up! Anyway, I went straight to the local record store where I found Ego, and I bought it, took it home and put it on my turntable. To begin with it was like hearing another language - a higher intelligence trying to speak to you - and I couldn't understand it. But the following day I put it on again and bang - I got it! That was the moment that Tony Williams changed my life. Another key part of your development as a drummer was being accepted into Berklee, wasn't it? It really was and I studied with Gary Chaffee, who at the time, was just compiling all of his concepts that went on to become a full series of method books. I already had a knowledge-base before I arrived at the college, which helped me get through Gary's curriculum pretty quickly, but I never saw studying as work, you know? Quite the opposite in fact - I couldn't get enought of it and just soaked up all of the new information coming my way like a sponge. Steve and I actually knew each other before we arrived at Berklee, but after bumping into each other again at the inauguration day, we would always hang out together - along with another friend of ours called Frosty. And the three of you badded yourself a lesson with the master of groove, Bernard 'Pretty' Purdie... How did that all come about? Steve had heard that Purdie was teaching in New York, so we went to see him. After giving us all hot chocolate and cookies, the first thing Bernard did was tell us never to argue with the engineer! Then he asked each of us to sit down and play him a rudimental solo, which we did, and then a groove, which we did. Well, we played what we thought was a groove, and then Bernard sat down and played one... I happened to be standing right behind him at that point and it was my third major 'light bulb' moment. My whole body just got it - this is funk! As we were leaving, Bernard told us to come back the following week with an essay about what we had learnt. I never did the essay and I never went back, though... I knew that I'd seen what I needed to see - and it was a major revelation - but I also knew that it wasn't something that could be taught; You either got it, or you didn't and man, I'd got it - big time! You'd hoped to continue your studies at Berklee further, but weren't in a position financially to carry on for a second year, were you? I couldn't afford it, simple as that, and Chaffee told me that I needed to move to New York and get a gig. And that's exactly what I was poised to do but, at that last second, I ended up going to California instead. A couple of my friends in Los Angeles had offered me a place to crash, so I got on a bus with my drums, a suitcase and $80 dollars... I guess you are happy to do that stuff when you are 21 and all I could think about was getting a cool gig playing music that I loved. So, as the new kid in town, how on earth did you manage to land an audition with the mighty Mr. Zappa in the fist place? You had to audition on Terry Bozzio's famous black double bass drum Gretsch kit, didn't you? That night Frank came and picked me up in his Rolls Royce, took me to Spago [a fine dining restaurant in Beverly Hills] for dinner, and then to his house to meet his wife. I'd just turned 22 and that was a pretty special evening. Getting the gig with him meant so much to me because he'd been such an important part of my high school years, and it was amazing that it should happen just when I was starting out. He did - it was a whirlwind. We'd rehearse for two months, for eight-and-a-half hours a day, and during those rehearsals he would change things all the time and just expect us to remember all the different versions. Sometimes we'd do one show a night, sometimes two, and we always did long soundchecks before them - even though the shows themselves could be up to two-and-a-half hours long, complete with drum solos and the works. It was gruelling, but I was young and I embraced it all. We'd carry around these folders of music too, composed note by note, and during a gig Frank would randomly turn 'round and shout out the number of the one that he wanted us to play. We'd all be scrambling around in the half-dark, trying to find the right bit of music to sight-read, knowing that we'd better get it right... Frank would give us hand signals for time signature changes, numerical or stylistic shifts, and, if he wanted a solo, he'd just turn 'round and point at you. It was pretty demanding. Back then I was really into it, and I suppose I did have a certain reputation. I can still read pretty well now, but I just don't have to do it as much these days, because, unless you are an orchestral player, that requirement has gone out of the window. It's like a language really - if you are fluent and then have a break, you are bound to stutter a bit when you try again - and when I'm doing sessions now, I tend to use cheat sheets or rhythm charts most of the time. After three intense years with Frank, you took the decision to leave the band and pursue your dream of becoming a session drummer? I had the opportunity to play on two records that I really wanted to do - one was with Gino Vannelli and the other was with a band called Pages. I'd always wanted to do sessions but the trouble was that I'd get off the road with Frank and play clubs, but I couldn't get arrested when it came to studio work. When the offer to do those records came along I felt that if I didn't grab the opportunity then, I might miss my chance altogether. Frank understood and that's how it all started... After those first two records someone else called and then I started working with Tom Scott, who recommended me to someone else, and so on. It just slowly built up during the '80s until - right before I auditioned with Sting - I was doing up to three or four sessions a day. How did you approach the quantity, and the variety, of sessions that you were doing at that time? Well, your mind starts to work in a way that puts your skill set and creativity into action immediately. You are there to serve the music, so you go through the possibilities of what is appropriate - trusting your gut, because that's what you are trained to do. It's about being professional and being able to switch yourself 'on' and 'off', because there is no time for dilly-dallying or indecisiveness. When I first started out, I was scared, but you can't let yourself be gripped by fear. I got some tough love from other musicians - and you had to be able to take those punches - but that's just how they rolled, and when you walked into that studio you had to be ready on so many different levels. I would always listen to the bass player - they had your back if they knew you were in there applying yourself. When the whole phenomenon of cutting, pasting, and looping arrived there was this standing joke about only playing four bars and getting the thumbs-up from the control room. What happened to the art of being a professional musician? I worked with a guy once who took it upon himself to move my backbeats. He had looked at them on the grid, and because they looked behind, he fixed them. When we listened to the playback it sounded horrible and I knew that what I was hearing wasn't what I had played. What this guy didn't realise is that I had played like that on purpose... I can put beats on the grid no problem, but it's got to sound good, and you don't need to look at a computer screen for that - just use your ears! Yeah, here's another novel idea for you... Why don't I actually play with the bassist? If there is no bass on the track it unnerves me greatly, but the point is that both of you playing at once means the synergy is greater than the sum of two parts. If I play and there is no bass, sure I can come up with patterns, the bridge and chorus, but now the bass player is locked into that. If we had played at the same time though, there would be so many more possibilities with the structure, and bass and drums is the whole foundation... That interaction is being lost and it's so important to learn how to work and communicate with other people, if that goes, what is there? Really it's a reflection of the whole virtual world we live in, though - there are all these different ways to communicate badly now, when actually we haven't even learnt how to communicate well one-on-one yet. Do people really think about what they are doing, or do they just go along with it? That's like saying 'eat poop - millions of flies can't be wrong'. But tell me, why should you be able to take someone's work without them making any financial remuneration for it? As far as I'm concerned, it's no different to walking out of a grocery store with a loaf of bread that you haven't paid for. And the fact that it's called file 'sharing'... That's just hijacking the language to make it sound okay. Some people will dismiss me as a grump, resistant to change, or a rock star jerk because they think that I lead a glamorous life. But, I've got news for you... I'm just trying to make a living here, along with an awful lot of other musicians. Over the course of your career you have worked with such an incredible line-up of artists... It must be hard to pick highlights, but getting a phone call out of the blue one day asking if you could pop down to the studio to record with Joni Mitchell must be pretty high up there. It was surreal - the most amazing opportunity. Shortly before, I'd been lucky enough to watch a session she did for the Mingus record with Jaco Pastorius [bass] and Wayne Shorter [saxophone]. What I witnessed that day is beyond description and it was uncanny how the three of them were like one mind. I'll never forget it. I did Wild Things Run Fast with Joni, which led to a world tour, and working with that band - Larry Klein on bass, Michael Landau on guitar and Russ Ferrante on keyboards - was the most wonderful experience. I feel very fortunate to have been involved in those songs and that level of musicianship. Our paths actually crossed early in my career, but it wasn't until we were both involved in a tribute session for Les Paul that we saw each other again, and shortly after that I got the call... The band with Tal Wilkenfeld, Jeff and me was another very special time - one of the best musically that I have ever been involved in. I met Herbie soon after I arrived in Los Angeles and finally working with him was fantastic! Again, we'd had some opportunities earlier on, but they just didn't work out and I really thought the chance had gone. But you just don't know what life has in store and I'm a firm believer that things happen at the point they are meant to - when you really have something to say to one another musically. So, maybe the lesson is to be patient and just enjoy where you are now, because all is never lost. Winning your first Grammy with the Five Peace Band - comprising you, Chick Corea, John McLaughlin, Kenny Garrett and Christian McBride - must also have been a very special moment. Again, amazing and surreal, and to win with a live record that Chick just decided to do off the cuff... I couldn't have wished for it to have happened under any better circumstances and with those people that I love. When I look back now, I've really been so fortunate to have worked with so many of my musical heroes, and it's insane, because they are the reason I started playing music in the first place. They operate on the level of transcendent and they take you to a higher level. Do you have any plans for another solo project? I've lost count of the number of drummers who have commented on your ability - particularly on Sting's Ten Summoner's Tales - to make odd-time sound so smooth. What's your secret? Well, firstly I have to thank all the players who've said that - it's very flattering and an amazing thing to hear. The reason that it sounds the way it does is because one element of the kit is playing over the bar - meaning that it is maintaining a pulse that doesn't always resolve itself on the downbeat. Instead it carries over the space of two bars, so there is always a quarter-note pulse that would not necessarily happen otherwise. That idea when we recorded the record was nothing new to me - it was a vehicle that I regularly used and employed. But the idea to do it on those songs was actually Sting's, not mine. He preferred people to be able to recognise that quarter-not pulse. Evan as a kid you were fascinated by odd time, wern't you? I would just go and play in seven for an hour - drumming over the bars and enjoying that feelng of fluidity. And, once I was exposed to it, it was game over - it was like a new vista for me. I'm sure that I had the propensity for it all along, and of course, I could make it sound like it was in odd time, but I also enjoyed smoothing it out. And that just happened to get documented on Ten Summoner's Tales. You have influenced and inspired so many drummers over the years. Sitting here now, how does that make you feel? So many things have an impact on the way that we play - stylistic approach, time feel, technique, vocabulary, etc. - and I'm really grateful for whatever I have contributed. Overall, I just feel incredibly blessed to play music, and have that go where it needs to go and say what it needs to say. In that process sometimes I steer, and sometimes I'm being steered. Perhaps ultimately though, I'm being steered - even though I like to think that I'm doing the steering. My life was changed when I first heard Tony Williams on Ego. It's so hard to describe the effect that his playing had on me, but I just got it, you know? With something like funk it's the whole feeling, beginning in the groove, and the understanding of that groove. But, with Tony, it was his concept and it was a completely different concept to anything I'd been exposed to before - wide open and free in its approach, yet inside a structure that I wasn't used to hearing. It was the phrases and how he interacted with the other percussionists, the forms of the compositions and what they were saying, the way he played time on his ride, and the way that inside those grooves and everything else going on he would explode and play this incredible open roll and crescendo. It was a million things - the whole musical effect - and it just opened up to me. It was a total barrage and it took a while to assimilate all of the different things that I was being exposed to. Tony was heavily influenced by Max Roach, who'd had this percussion ensemble called M'Boom, and interestingly, Ego was also like a percussion ensemble with organ - it was amazing. And with the afro and jazz influence, and the percussion family, it was groundbreaking stuff. Tony's musical vision came through in his playing - it illustrated his musical concept perfectly - and every drummer should strive for that. Even if you are a session player, or someone who likes a lot of different music, you still need to have a concept. Tony was visionary and that overall concept validated what he was saying musically. I first met Tony when I was with John Patitucci and we opened up for V.S.O.P. in France. There was Tony, Wayne Shorter, Ron Carter, Herbie Hancock and Freddie Hubbard, and I just freaked out when I heard who we were supporting! Anyway, we played and then while we were watching V.S.O.P., John told me that they had actually been watching us... It was better that I hadn't known that at the time, or I would have frozen. When we got back to the hotel that night, Wayne and Tony were there, and I went up to Tony and spontaneously thanked him from the bottom of my heart for what he had done for music, and for changing my life. I think Tony sensed my sincerity, and not long after that, he befriended me. The next thing I know he's calling me up - the first time I heard his voice on my answerphone I nearly fell over! We would chat about different stuff and one time I remember him telling me that he was considering using two bass drums... I told him not to, because he was already killing us with one! I am so thankful for everything that he gave to me and to the world - he's my hero. My recent decision to change my instruments so radically is not one that I've taken lightly, nor did it happen overnight - it's something that I've been thinking about for quite a while. I became aware of Paiste again over a year ago, perhaps even longer... I was in my drum warehouse and happened to walk by a cymbal on a stand - a 20" Traditional ride - and some hi-hats. I casually tapped them and then stopped to ask my tech what they were, because I hadn't seen them before. How their presence escaped me for so many years is a mystery. Anyway, I investigated more and discovered a whole array of sounds that erased any preconceptions I might have had. I saw a commitment to sound, quality, variety and consistency, which is so important to me because I operate in different areas and situations all over the globe. The more I played the cymbals, the more I discovered and the more I liked them. My ear became accustomed to the sound and I was convinced that they would work for me musically. They just sounded great and there was no special selection necessary either - and that's a good feeling because it simplified an important aspect of my musical life. Around the same time I also became aware of the buzz around Ludwig, and my interest was further piqued when I tapped a few drums. Along with that heritage name, I always felt that Ludwig was one of the few brands that had real character and, after seeing Ringo on them with The Beatles, they were the first drums that I really wanted! So I heard the new kits and they sounded great - and, most importantly, they sounded like Ludwigs. They were also versatile, easy to tune and friendly to play, and I was impressed by all of that. But then they went one step better and revamped their entire hardware line. And to have a complete kit of great drums and hardware that is ergonomic, well thought-out and feels good is something I really missed. Again, it just simplifies everything for me. When I was a kid, my drum teacher and I used to look through Ludwig catalogues and it was all there from top to bottom - good, one-stop shopping, it's not rocket science, nor does it need be - it just all works together and sounds good. You can set everything up easily and then concentrate on what you are supposed to be doing - playing music. I really look forward to sitting down behind my instruments. I'm getting great comments about them and I'm having fun... And that says it all.